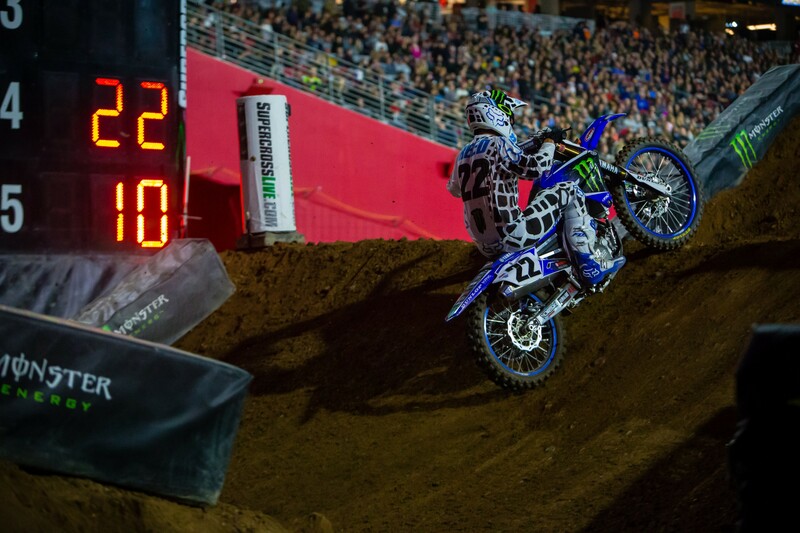 Last Saturday night inside University of Phoenix Stadium in Glendale, Arizona, Monster Energy/Factory Yamaha’s Chad Reed, looking much better than he had thus far in Monster Energy Supercross, raced to a thrilling runner-up finish in the 21-lap main event. It was his first podium finish in the last 12 races (the last one came in Atlanta last year) and it marked the 131st podium of his career. Furthermore, the charge he made in getting himself up on the box certainly proved the 15-year supercross veteran still had the right stuff. On Wednesday afternoon, we crossed paths with Reed to drill down and see what led up to his amazing form. Racer X: Chad, how’s it going this fine mid-week afternoon? 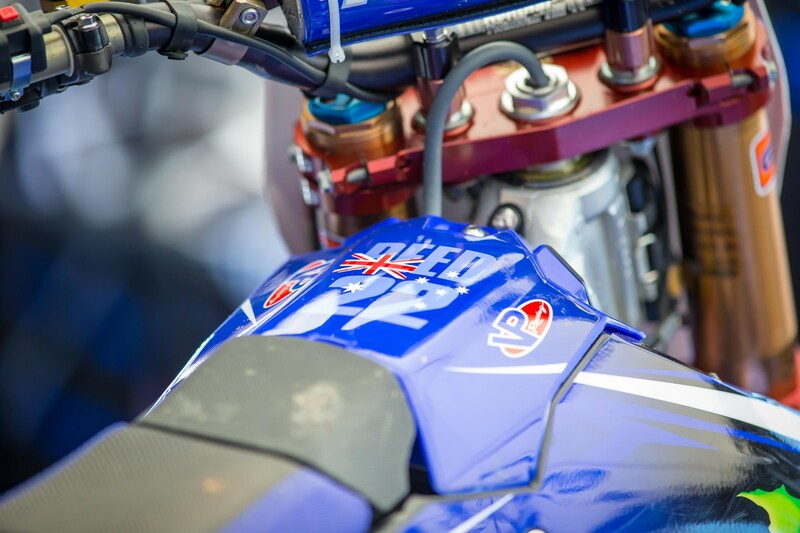 Chad Reed: Going good. Going good. I’m back in Florida and just driving to pick up my kids from school. How do you feel about what played out for you last Saturday night? A couple of days have gone by and obviously I’m excited and I think more than anything, just relieved. You know you believe something, like you believe that’s where you belong and what you’re capable of and when you’re falling short of that goal, it’s not a great feeling. I definitely feel a little more at ease with myself knowing that what I believe is true. But yeah, onwards and upwards and already focused on the next race. It’s kind of the downside of racing in that you’re only as good as your last race. You’re excited in the moment, but then you move on right away because you can’t be complacent and there are always things to work on and we’re back on the grind already. The morning of the second race at Angel Stadium you and I talked for a little while. You were staying positive, but it was also pretty easy to see that you were frustrated. At that point, were you and the team trying to get a host of things sorted out? Going back, it was a good and bad off-season. Good on a personal level. I felt that coming into the year I was much, much happier than I was at this time last year. My energy, my body, just everything felt like it was firing on all cylinders. But there were definitely some things that I was frustrated with and things that I felt that I needed to be better at. Like I spent the whole off-season kind of fighting a few things in a few areas. It just seemed, for whatever reason, we were unable to hit those areas as good as I felt we needed to. That was the frustration. You’re excited and you’re healthy and you’re fighting fit and you feel ready, but when you’ve been around the block a time or two you understand that there is a feeling that needs to be accomplished and I felt like I was a little under that feeling. Going into the season I was confident, but I was also reserved in knowing that we had things to improve. Did these issues and areas you speak of concern the motorcycle? A little bit. We were much improved from last year. Like if you were to compare 2016 to 2017, I just felt like everything was much more clear. My issues were consistent, and although there was an issue, you want your issues to be consistent because then it allows you to work in that particular area that you need to work on. Throughout the off-season my issue was always clear and always consistent, so that was frustrating. It was just a matter of time that we could get on top of it. This year we got a new fork and I think it was a more positive fork and a better direction, but I felt like we needed to understand it a little bit better. My initial testing of it was positive, but there were some things we were falling short on and I felt like we could be better. Unfortunately to be better, you have to go racing. It’s one thing to tell the team or the suspension guy that you’re struggling in an area, but when you go racing the issue is much more clear. Sometimes it’s easier to achieve and work on that area once you go racing and you get up against other people. All of your weaknesses are always brought to the surface when you go racing. Yeah, it was a positive off-season, but there were things I felt needed to be better and it turned out to be true. You’ve mentioned to me before that you’d be interested in developing a role where you would work, concurrently, as racer as well as a sort of technical director. What you just spoke about seems to track with that type of concept. Thoughts? You know I love this sport. It’s something that I’m very passionate about. When it’s something that you’ve been around for 31 years, I’ve seen a lot. I’ve worked with a lot of amazing teams and amazing individuals over the years and the fact that I have the experience of running my own team, I miss that. I miss what I call the baseline and working in the battlefield and working with the mechanics and working directly with the individuals that are accountable for the performance of the team. That’s what I miss the most from my own team. I don’t miss paying the bills and being responsible for a $4 million dollar race team. That part of it being gone I’m totally okay with. I miss the interaction with the personnel and finding ways to be creative and looking for new vendors to make new parts faster and easier and cheaper and at the same quality. Just all those things are something that I’m really passionate about and I enjoy and it’s fun. We’re four races into the 2017 season and about to head to Oakland. For the most part, are you where want to be right now? I feel good. Everybody seems to want to comment on my age and it is what it is, but I don’t feel a day over 21. I still feel good. I still feel committed. I still feel passionate about it and healthy and I’m fit and strong. And then this weekend I was fast. It’s a good combination of things. You know for me it’s that you never want to get ahead of yourself. Our strengths are when the track is a little hard and when the whoops are difficult and things like that, so I know behind closed doors that we’ve made huge improvements and I feel much more confident about where we are today as opposed to where we were at Anaheim 1. But I don’t want to get ahead of ourselves. I still feel that there is room for improvement. My debrief after the race was pretty clear in the fact that I’m thankful for where we’ve come and I’m thankful that we’re better late than never and that we’re making good progress, but there is still room. So we’re waiting on parts to be made and I think that will allow us to go to the next level. For myself, I want to do well on a track that is rutty and has a lot of traction because that’s been my weakness. I want to be able to kind of tick that box and know that the feeling is consistent and that we’re heading in the right direction. As excited as I am about the performance in Phoenix, for me that’s just a tick of the box and what I believe is true in the fact that I can still do it and I can still run up front with the very best. Now it’s just a matter of ticking personal boxes and I want to be better in the traction and in the rutty conditions because that’s something that I really, really struggled with in 2016 and then a little bit at the beginning of this year. That’s the next box I want to tick. Which can be really advantageous when you guys head back east, right? Exactly. And I think, in all honesty, we show up at Anaheim and San Diego and they’re typically pretty hard-packed tracks, but we’ve had a lot of weather this season and the first three races were all rain affected races with a lot of moisture in the dirt, so they were actually really East Coast-like tracks—rutty and soft and things like that. We got a heads up of the East Coast much sooner than normal. My issues started with Oakland last year, so I think the progress that we’ve made in one year has been huge and I’m excited to go to Oakland and hope that we’ve rectified a lot of those weaknesses that I felt that we had. I’m excited for many reasons heading into the weekend. It looks like there is weather in the area all the way up until Saturday, so that will obviously make the track on the soft side and on the rutty side like it was last year. Bring it on. You kind of want your weaknesses exposed so that you can grow and learn and be better, you know? When we head east, we’ll have a full head of steam and get after it. Can you still win the title? Man, I mean I’m 40 points out and we’re going to need a mistake from Ryan [Dungey]. It’s way too soon to be talking title. I think you talk title at Anaheim 1 and that you’re hopeful, but having three races far, far below your expectations, you have to reset and be realistic. At this point I’d be happy to be a podium contender week-in and week-out and challenge for race wins. Ultimately, eventually I’m hoping I get that race win. The race win is a big win for me right now. A lot of records come my way when I get this victory. I’m not a big records guy, but those are meaningful things, you know? When this is all over and said and done, that’s something to hang your hat on. Being the eldest rider to win a main event would show the lifespan of my career and how many years that I’ve been able to win races. So I just think for me that’s something I would look back at when this is all over that I would be proud about. Though I’m not big on records, this one would mean a lot. And that cheer of the crowd for you in Phoenix? Yeah, it was crazy! I mean truthfully, I’ve won 44 main events and I’ve only ever heard the crowd go that crazy for a win! So to send the crowd off with just going into second was very positive. It was a weekend that I was proud of and I think it is hopefully getting back to where I believe is a realistic place for me to be.